Serialize DependencyObject: It's easy ! Jonathan creates software, mostly with C#,WPF and XAML. He really likes to works on every Natural User Interfaces(NUI : multitouch, touchless, etc...) issues. 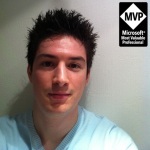 He is awarded Microsoft MVP in the "Client Application Development" section since 2011. You can check out his WPF/C#/NUI/3D blog http://www.jonathanantoine.com. He is also the creator of the WPF French community web site : http://wpf-france.fr. Any easy solution for generics too?